The beach of the Sancti Petri Melia Hotel in Cadiz was the scene of the following video filmed by Spanish locals. As we’ve told you, given that the Libyan route to Italy was closed by Italian Interior Minister Mr. Matteo Salvini (who keeps returning ships that are picking up African migrants, disallowing them from entering Italy) and the Balkan route to eastern Europe by Hungarian Prime Minister Mr. Viktor Orban (who built a fence and other countries near him followed his example), the Spanish route (from Morocco’s northern coast to Spain’s southern tip) is the only remaining route available for African migrants wanting to make it over to Europe. 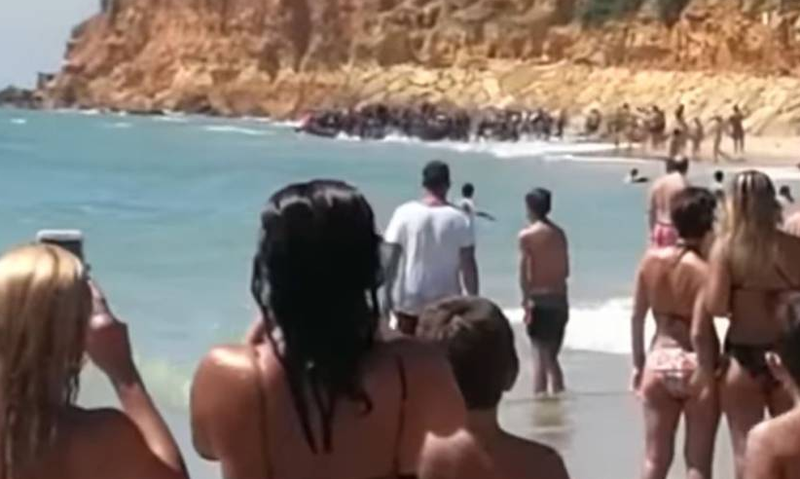 50 of them cheekily got into a Zodiac rubber boat and simply sailed to the beach in Cadiz where locals filmed their arrival. The Melia is a luxury hotel chain. It operates a 5-star hotel in Cadiz which has a private beach where the migrants went ashore. Related coverage: <a href="https://thegoldwater.com/news/34874-Spain-7-Police-Officers-Injured-As-100-Migrants-Throw-Acid-At-Them-Crossing-Border-Video"> Spain - 7 Police Officers Injured As 100 Migrants Throw Acid At Them Crossing Border (Video)</a>. The Civil Guard said 25 of the migrants, 19 children, and six adults, have by now been detained and were in holding centers before being returned to Morocco. The authorities in Cadiz said they were looking for the remaining migrants. According to the International Organisation for Migration, the number of migrants and refugees using the western Mediterranean route to reach Spain stood at 20,992 between January 1 and July 25. Local authorities claim the number is far higher. They are not migrants..wtf is the matter with you ppl who write theses articles..
>The minors will be taken to youth centers and the adults to a secure migrant holding center called a CIE.